Bob Boilen of National Public Radio wrote this piece. The story of Bernie and the Believers is the most powerful I’ve ever come across at the Tiny Desk. It’s about a beautiful act of compassion that ultimately led to this performance, and left me and my coworkers in tears. 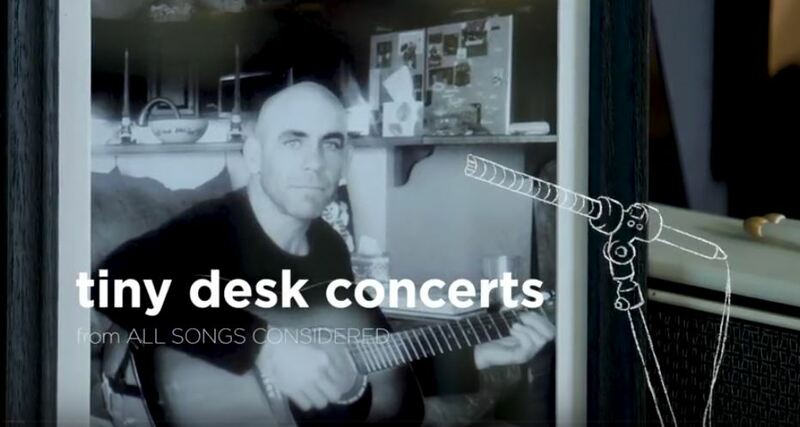 I discovered the music of Bernie Dalton among the thousands of Tiny Desk Contest entries we received earlier this year. The band’s singer, Essence Goldman, had submitted the entry and shared Bernie’s story. You can hear her tell it in her own words at the Tiny Desk (and I choke up every time I hear it) but she said that a few years ago, Bernie — a father, a songwriter and a musician in his mid-forties, and an avid surfer with a day job as a pool cleaner — answered an ad Essence Goldman posted offering voice lessons. In addition to being a singer, she was a performer trying to manage her own career as a single mom, and Bernie was trying to improve his talents. Bernie drove 90-minutes from Santa Cruz to San Francisco, eagerly showing up early to his voice lessons with Essence. But not long after they started working together, Bernie lost his voice. They didn’t think much of a it at first, but then things got worse. He had trouble swallowing and eating. Essence encouraged Bernie to see a doctor and after some tests Bernie Dalton was diagnosed with bulbar-onset ALS, or Lou Gehrig’s disease. He began to lose the use of his hands and, along with it, the ability to play guitar. With a prognosis of only one-to-three years left to live, Essence offered to raise money so that Bernie and his daughter could travel together. But what Bernie wanted more than anything was to make a record. So he asked Essence to not just be his voice teacher, but his voice. From there, they got to business. Essence pulled together a team of producers, engineers and musicians, while Bernie guided the creative direction through gestures and a dry-erase board. They wrote and recorded a new song every day. Their first single, “Unusual Boy,” was the one they included in their 2018 Tiny Desk Contest entry. Now Bernie’s friends have gathered here in Washington, D.C. to perform his songs. All the while, Bernie watched and listened from his hospital bed on the West coast, communicating with us in a live video feed through his eye-gaze device. What you are about to witness is the ultimate act of love: Essence sacrificing her own musical ambitions to fulfill the dreams of Bernie Dalton. Through tragedy there was beauty. I don’t know Bernie or Ms. Goldman, but after watching this, I believe they are worth helping. If you can, watch the entire piece. Ms. Essence Goldman told the story at the 9:02 minute mark. This group of talent artists understand the power of love. Beautiful.